Continuing our Crystal Skulls Series, I am pleased to offer a guest post from Lily L. Diamond, healer, intuitive, and the magnificent blogstress at Green Mother Medicine. For several years now, I’ve been seeing 11:11 many places. I glance at the clock, 11:11. I receive an email and notice it was sent at 11:11. I send an email at 11:11. At the checkout stand at the grocery store the cashier says, $11.11. And to be honest, I get other married number sequences too — 4:44, 5:55, 2:22, 3:33, 1:01, 2:02, 6:06, and so on. But, as you know, it’s the Eleven Eleven Eleven date that’s received all the attention. being part of the Mayan calendar prediction of the world shift coming in 2012. Yes, the universe conspired to place me at the 11:11:11 Crystal Skull Conference and Mayan Elder Gathering in Los Angeles. A few months ago, I made a visit to one of the world’s most beloved metaphysical bookstores, the Bodhi Tree Bookstore, which opened in 1970, and will be closing within the next year or so. The new tarot card section was calling to me. Out of all the decks, wrapped in their shiny plastic, a single box, with a tiny “used” label caught my eye, the Crystal Skull Message Cards. One of the first cards I chose was: 11:11 Transformation – “Many lightworkers believe that the 11:11 is a pre-preprogramed wakeup call from ancient times, such as Atlantis, in order to help us activate our energy awareness, inner knowledge and healing abilities….Watch out for 11:11, it can appear on clocks, microwaves, receipts and just about anywhere you might see numbers. An amazing spiritual shift is about to happen!” Okay! I took those cards home and began using them on a daily basis, integrating them into my morning oracle sessions, to become acquainted with them. Many times when I asked about my Green Mother Medicine essence, the cards, Earth and Nature came up. The Earth card has a comment that shamans were often buried alive in the earth, which is one of my past life memories, so I definitely got a cosmic wink along with the obvious match of Earth being part of Green Mother Medicine. The Nature card says, “Show appreciation for the plant kingdom.” That made me smile, as in addition to being an herbalist and an avid gardener, I’ve been blessing seeds and seed balls, water and earth as part of my Green Mother Medicine gatherings. And when I asked about an upcoming trip to Hawaii, the message card was Abundance Island. I was so blown away by the cards, He completely agreed with me that The Crystal Skull Cards have such useful commentaries for our current cosmic climate shift. The cards originate from White Elk Woman who tells her own story about them at her website. In searching for a way to purchase more cards, I signed up for a newsletter where I read about the Crystal Skull and Mayan Elder Event for 11:11:11 in Los Angeles. I contacted Kendall Morgan who coordinated Crystal Skull events for 9:9:9, 10:10:10 and is working now on 12:12:12. I offered to volunteer for the conference, it felt like the perfect thing to do. And, indeed, it was a perfect thing to do and a perfect place to be. 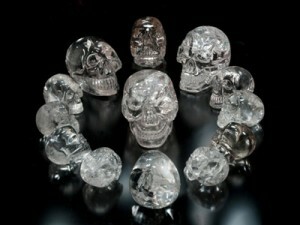 Meanwhile, you can learn many, many, many things about the crystal skulls at the Oracle Stone Productions website here. The Bodhi Tree Bookstore website is here. Lily L. Diamond is a healer, dreamer, intuitive, singer, musician/composer, writer, ritualist and teacher. Lily offers individual and group sessions for self-empowerment. For information on Lily’s highly recommended intuitive readings please email her at greenmothermedicine (at) gmail (dot) com with the subject line “Green Mother Medicine Readings/Healings” – I’ve experienced one of Lily’s remote/telephone sessions and it was profoundly insightful and relaxing. Subscribe by RSS feed to the Green Mother Medicine blog, here. I was one of the lucky few who received a preview copy of M.J.’s new novel THE BOOK OF LOST FRAGRANCES due out in March of the new year – I drank in every word and luxuriated in the sensual storytelling that M.J. has by now completely perfected. In keeping with her themes of reincarnation and past lives, M.J. continues to explore the concept of “memory tools” for recalling former lifetimes. (It makes for incredibly fun reading across multiple centuries.) Remembering is something we all tend to do at the end of the year, around this time, as we simultaneously strive to envision a prosperous and happy year ahead. And remembering, or rather memory itself, may be something that is more universal and mysteriously meaningful than we ever thought possible. Consider the possibility that water may actually have memory. Could water be the ultimate memory tool? A sweeping and suspenseful tale of secrets, intrigue, and lovers separated by time, all connected through the mystical qualities of a perfume created in the days of Cleopatra—and lost for 2,000 years. Jac L’Etoile has always been haunted by the past, her memories infused with the exotic scents that she grew up surrounded by as the heir to a storied French perfume company. In order to flee the pain of those remembrances—and of her mother’s suicide—she moves to America, leaving the company in the hands of her brother Robbie. But when Robbie hints at an earth-shattering discovery in the family archives and then suddenly goes missing—leaving a dead body in his wake—Jac is plunged into a world she thought she’d left behind. Welcome 2012! Happy New Year Everyone! May we have peace on earth and goodwill towards all. What’s your favorite book you’ve received as a gift, and why? I’m Jewish but we celebrated Christmas growing up. My dad was in the toy business, and to a man in the toy business, December 25th is a holy day no matter who you pray to the rest of the year. We had a rule in our house: no matter what time my sister and I woke up on December 25th, we couldn’t wake up our parents until 6 a.m. And then, painfully, excruciatingly, agonizingly, we had to wait until my mother made coffee and my sister and I each drank down a full glass of orange juice before we could start opening presents. And then it was a wild free for all. When the dust and the ribbons and the wrappings settled, no matter how many Barbies and Barbie clothes and doll houses and stuffed animals and games there were under that fashion tree, my favorite presents were the books. To this day I still have almost all those books and none of the toys, and my favorite is ELOISE AT CHRISTMASTIME. Every year on December 25, at some point during the day, I pull it out and read it again. Of all the characters, in all the books I had, I related to Eloise the most. She lived in the Plaza Hotel on 59th and Fifth — only twelve blocks away from where we lived. I got into same kinds of trouble she got into. She had a turtle. I had a turtle. My school uniform was a carbon copy of what she wore. My hair was just like hers: stringy and messy. And she was always with her nanny, never her parents, because they were always away. While my mom was there, my father wasn’t around as much as I wished he was. Part of that toy business job required him to travel constantly, and I missed him so very much so very often. Somehow, because of that, there was a special bond between us, and every year at Christmas he gave me something special — something just from him to me. 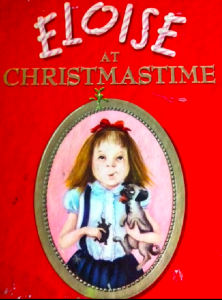 This is one of the reasons ELOISE AT CHRISTMASTIME is such a special book to me. On the first page, the illustrious Hilary Knight drew Eloise holding up a giant-sized wrapped gift with an overly large gift card tied to it. On the card are spaces for the giver of the book to fill in the appropriate inscriptions. My copy says: To Melisse With Love From Daddy. We don’t have the pink tree anymore, but every year I give my father a copy of my latest book hoping it means as much to him as my copy of ELOISE AT CHRISTMASTIME still means to me. And I always write To Daddy With Love from Melisse. Note from the editor: My five-year-old is a big fan of this book too, we read it every Christmastime.